Lithium batteries have been around commercially since 1990. After three decades, you’d think that most questions about what goes into Lithium batteries, particularly those about the metals and their associated costs, would have easy answers by now. We at The Deep Dive liked to think so, until a discussion on the subject last week nearly brought us to arms against each other. Fortunately, a moment of clarity – or maybe it was Steve realizing that the coffee pot was empty – caused us to put down the compostable flatware and our paper plate shields, and suit up for an info dive. It’s true that decades past have settled some questions about Li-ion cell chemistry. The lithium battery is a lightweight system of storage cells offering relatively high energy density and output voltage, but it comes with acute safety issues. Abuse or shock (an EV crash, for example), external heat, overcharging, or failed separators, short circuits or dendrites inside the cell structure all can cause a chain reaction of thermal runaway, gas formation, exothermic explosion and fire. More recently, especially motivated by the development of all-electric vehicles (EVs) over the last decade, engineers have really drilled down in efforts to maximize the amount of energy that lithium batteries can store, charge and discharge quickly, while also minimizing battery size, weight, and safety risk. As a result, we’ve seen three dominant Li-ion battery chemistries applied for use in EV powertrains: Lithium Iron Phosphate (LiFePO4 or LFP), Nickel-Manganese-Cobalt (NCM) and Nickel-Cobalt-Aluminum (NCA). Given that EV battery costs currently hover around $200 per kWh, a Tesla Model 3’s 90kWh battery costs a big chunk of change – around $18,000. And that is just the cost, with no margin. If EVs are to be seriously competitive with Internal Combustion Engines (ICE), those costs need to drop by at least 25%, to around $145 per kWh. Lithium battery manufacturers are racing each other to beat the cost curve as seen below. Source: Accelerating US Leadership in Electric Vehicles (2017) | Union of Concerned Scientists, quoting ARB 2017; SOULOPOULOS 2017; VOELCKER 2017; SLOWIK, PAVLENKO, AND LUTSEY 2016; VOELCKER 2016; NYKVIST AND NILSSON 2015. What’s a lithium battery made of? Metals fill several roles in lithium cell architecture: copper (anode end) and aluminum (cathode end) foil current collectors, electrolyte (LiPF6), as well as Nickel, Cobalt and Manganese as Cathode Active Materials (CAM). The chemistry acronyms LFP, NCM (NMC), and NCA denote the battery cell’s CAM. Within the CAM, magnesium and cobalt act as stabilizing agents, with nickel contributing to the energy density of the battery cell. Lithium Hydroxide (commonly found in hard rock deposits) is preferred for EVs because Lithium Carbonate negatively impacts cathode quality. One of these minerals, cobalt, while not particularly rare, has a very problematic supply chain. Around 65% of the world’s cobalt supply is sourced from the Democratic Republic of Congo (DRC), where miners employ children, maintain unsafe working conditions, and disregard environmental impacts throughout their link in the chain. In 2018, the Council on Foreign Relations provided a good updated overview of challenges presented in global cobalt sourcing, which you may read more about here. Because so much of the world’s cobalt supply is sourced from the conflict-riddled DRC, battery cell developers are more than eager to reduce the amount of cobalt as a Cathode Active Material, while still improving the energy density and mitigating safety risks as much as possible. This has led to varying stoichiometry (relative quantities of components) within the CAM featuring lower Cobalt content. Technological advancements have taken the CAM from a 1:1:1 relationship (sometimes described as 3:3:3), to 5:3:2 Nickel-Cobalt-Manganese (NCM), and most recently to 8:1:1 NCM. 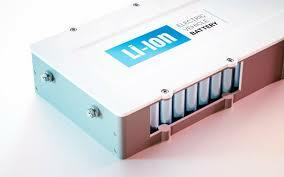 With the Lithium-ion energy storage market growing into the $billions annually, researchers have been very busy monitoring materials costs vs. performance for Li-ion battery cells. Models from Argonne National Lab (ANL) and others are constantly refining performance and cost estimates for various iterations of lithium batteries. The latest entry in Li-ion Battery cost modelling was published by energies/MDPI earlier this month. Different from other models that use fixed inputs for cobalt and nickel, this MDPI model uses real world data from the London Metal Exchange to calculate CAM costs, which when combined with other component costs lead to full cell costs and then scale up to battery costs. The model’s full research report may be found here. 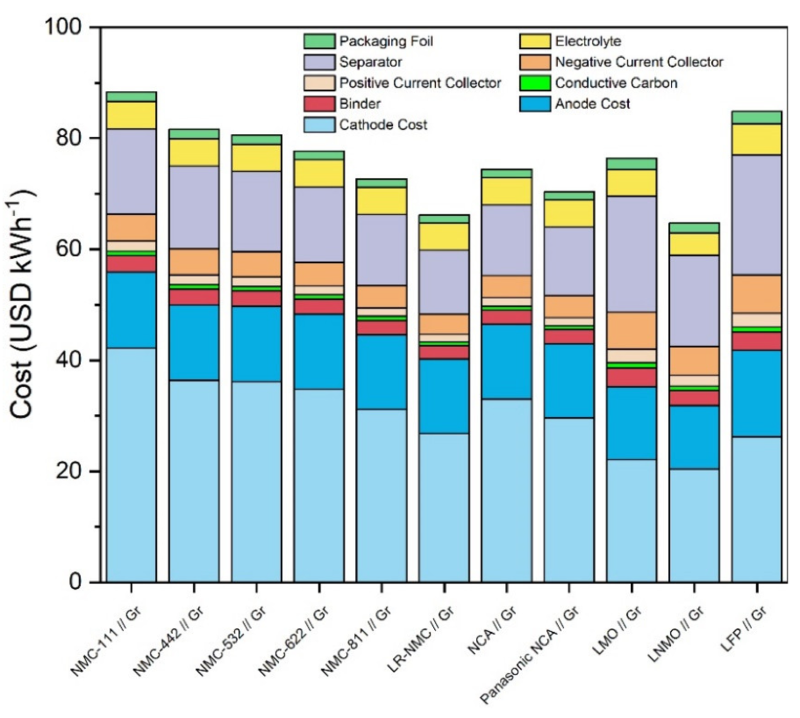 Its authors, Wentker, Greenwood, and Leker, offer a useful graphic breakdown of Li-ion battery materials costs, in USD per kWh of storage capacity for each cathode stoichiometry. Source: Wentker, M.; Greenwood, M.; Leker, J. A Bottom-Up Approach to Lithium-Ion Battery Cost Modeling with a Focus on Cathode Active Materials. Energies 2019, 12, 504. Comparing the three most recently competing chemistries (NCA, NMC-811 and LFP) we see that NMC-811 and NCA are very similar in most components’ costs, with the exception being the slightly higher cathode cost of the NCA. Recently, Panasonic reformulated the NCA for even lower amounts of cobalt. On the other end of the spectrum, for Lithium Iron Phosphate (LFP) cells which are cobalt-free, what those save in cathode costs are more than offset by higher costs in current collector foil (copper and aluminum) and in the polymeric separators. They also lack the density that nickel provides. Clearly the advancements in NMC chemistry have created a cost vs. performance advantage for NMC. While LFP chemistry is more inherently stable than NMC, the $8-10 per kWh overall cost reduction gives the competing NMC an advantage over a 35 million kg full mass-production scale. In NMC chemistries, the cathode (CAM) is clearly the largest cost component of Lithium cell materials. Of these, Lithium (in carbonate or hydroxide forms) and Cobalt are the most illiquid metals and most difficult to reliably forecast in price. 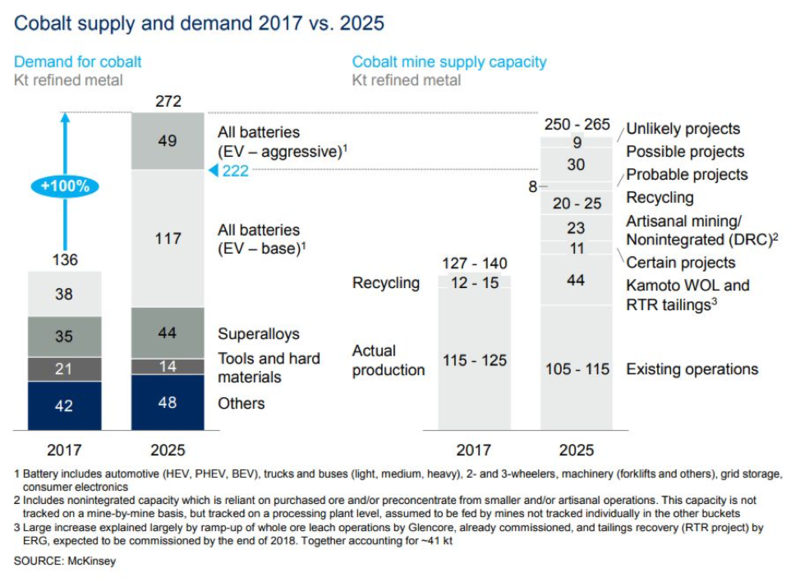 However, demand for these is easier to predict, and McKinsey & Co provided the following forecasts across all energy storage applications for 2025 vs. 2017, in its June 2018 Metals and Mining Report as seen below. Technological improvements on the Horizon – Less Metal, more Nanotech? New research suggests that one way to reduce battery costs and increase energy storage capacity may be to use silicon nanoparticles instead of graphite in Lithium-ion anodes. Chemists at the University of Alberta have found that silicon nanoparticles in graphene aerogels are able to withstand repeated cycling and boost capacity by as much as ten times that of current cell chemistries. You can read about it here, though bear in mind that this technology may be many years away from commercial production. Another breakthrough that appears much closer to commercialization is the development of “semi-solid” Li-ion batteries that replace inactive metals such as copper and aluminum at the electrodes with different materials, which reduces cost and weight and simplifies production. In December, lithium battery developer 24M raised nearly $22 Million from Kyocera and Itochu, among others to further stretch performance improvement from 20% towards up to 100% better than Tesla’s current best chemistry. 24M does not disclose which “different materials” are replacing copper and aluminum foil conductors. 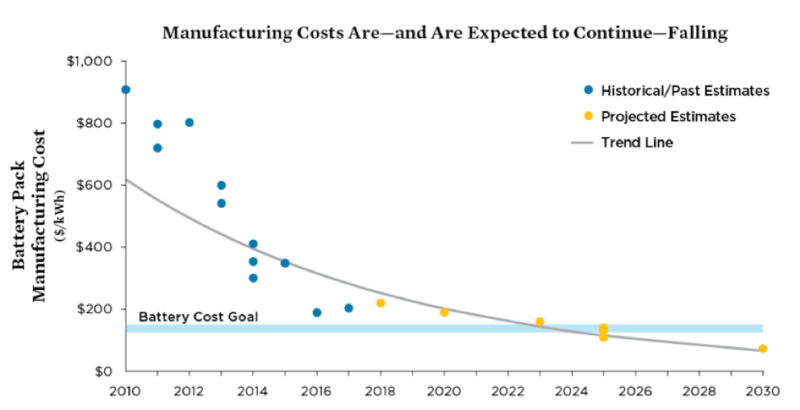 The first 20% leg of their performance boost may see production as early as 2020. Read about that here. Practically speaking, though, results from lab testing versus in real world application often vary significantly. Lithium battery manufacturing also requires a highly inert environment, as battery cells are very sensitive to moisture and other contaminants. As such, building new battery cell manufacturing facilities is very expensive. To help reduce costs, battery manufacturers are now building facilities closer to cobalt supplies (such as LG Chem in Poland, and Tesla in China). Mining and refining technologies are also being advanced, particularly in brine fields. 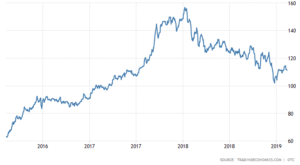 At the same time, demand for higher-quality Lithium Hydroxide is expected to outpace that of Lithium Carbonate, so hard rock lithium mining companies will be worth keeping an eye on, as well. 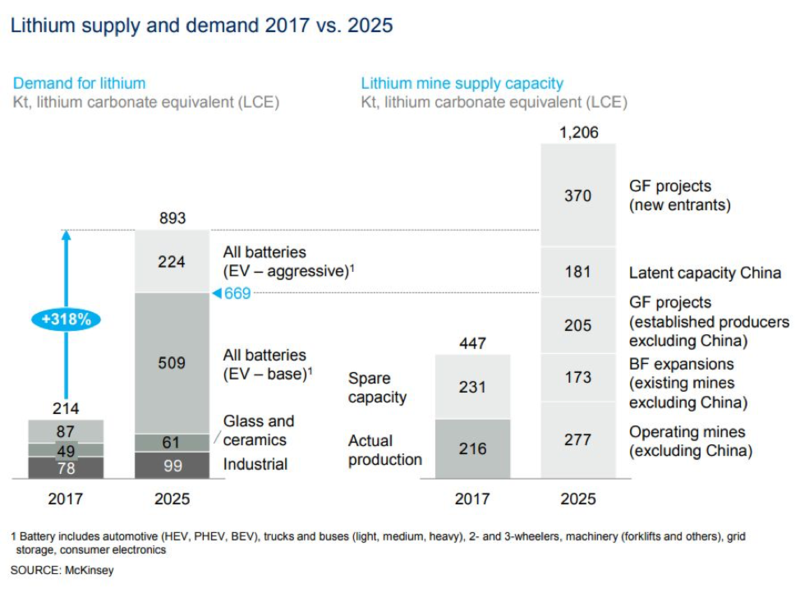 At any rate, given that battery cell metals prices are not expected to decrease as the demand for Lithium cells increases dramatically, battery manufacturers continue to work at every angle of the cost equation. Likewise, the Deep Dive will keep following energy storage technology closely in search of clarity on the horizon and emerging developments throughout the sector. 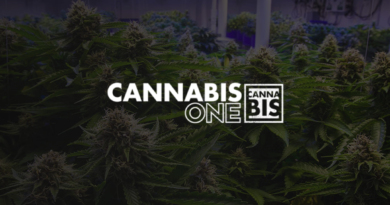 A Renewable Energy enthusiast, Craig has a Decisions Sciences business degree from Miami University and has been a freelance writer for several firms.